©2011 Victoria Laurie (P)2011 Audible, Inc. It was stll a lot of fun but I don't know if I like Abby and Dutch being Mr. and Mrs. Smith. I rather her be the Psychic who gets involved in the occatinal crime and not the spy who occatianly becomes psychic. But I have to say I loved the "bad guy" in this book... He is too attractive to not to come back! A new venue, some new characters, different type of story. While it's the same old Abby it's a different than the earlier books. Keeps the series from getting old and makes for a very good listen. Have you listened to any of Elizabeth Michaels’s other performances before? How does this one compare? Did Vision Impossible inspire you to do anything? If ever psychic determinations were needed it was in this book. What disappointed you about Vision Impossible? The story line was slow and boring. The narrator's voices are starting to get less and less different so as all the characters are beginning to sound alike. I'd also like to know when Milo began having that accent??!! Gave it a better storyline. The CIA looking for a drone just wasn't thrilling. I hope the next book is much better. What made the experience of listening to Vision Impossible the most enjoyable? I really liked the story. A little involved however if you follow it closely - it does keep in guessing on how it will end. I think the word "fiance'" may have been used too much. I know Abby must have been thrilled to be engaged but it seemed like towards the end she was telling everyone Dutch was her fiance'. I liked this book, just like I liked all the other Psychic Eyes stories. Fast listen and story keeps moving. This episode is full of action, violence, and darkness, and has a complicated plot. Abby sustains multiple concussions and other injuries with such frequency that you wonder if she and Dutch (who also sees more than his share of trauma) will become a pair of invalids before they reach 40. Abby's character also vacillates between strong/mature/competent and clueless basket case. I'm hoping for more humor and less violence in future installments. Offered a way to help “save her country,” new civilian profiler for the FBI Abby Cooper does not really want this opportunity, until she hears all the details and learns that her boyfriend Dutch will also be involved. She accepts the mission and begins some grueling training on self defense, how to attack and how to stop an attack, basically taking “spy lessons.” She also has to adopt a disguise so that no one will know who she is or that she is psychic. While she’s been learning to take care of herself, Dutch has been involved in the case undercover as a buyer for a new technology. A special military camera can detect people’s auras, just as Abby can do. However, the owners of this camera have, as reference, the aura of every major political and military leader in the world. This could lead to chaos in the wrong hands. Those currently in possession of the camera have loaded it into a drone aircraft that can hover and when it finds the aura of the target person, it can shoot poison darts that kill within minutes. The new weapon is being auctioned off at a weekend extravaganza in the Canadian wilderness where the men show off their muscles while their ladies are gorgeous females dripping off their arms. Not literally but those are the attitudes behind the formal wear worn in the evenings. The auction is held at one man’s estate which is very difficult to reach, even by plane, and is defended on all sides, since it occupies an island. Abby attends on the arm of a diplomat while Dutch attends as a potential buyer. They are not mated or paired together so they must work out a way to communicate without anyone becoming suspicious. They must stop the sale of this camera. This adventure had more “meat” to it and more to follow with identities and counter identities, pairing of couples together who really belonged elsewhere. Escape from the mission is just about impossible, so things can’t go wrong without dire consequences. I very much enjoyed this very suspenseful episode in the lives of Abby and Dutch. I found it very interesting to learn just how much training is involved to become a “spy” with the espionage and counter espionage. Always one factor balancing a counter measure. It really helped Abby see just how valuable on a grander scale her own perceptions could be. Elizabeth Michaels reads beautifully, reading each character as distinct from others plus handling the foreign accents of all the foreign buyers of this weapon quite well. Being the ninth book in the series she has read, I have become very comfortable with her voice and her portrayals of the main characters. All in all, a suspenseful and dangerous episode in the life of Abby Cooper, civilian profiler for the FBI and secret spy to save world leaders and their countries. No because it is stupid, insipid and overly long. The characters are so over the top and the story line is beyond my enjoyment. 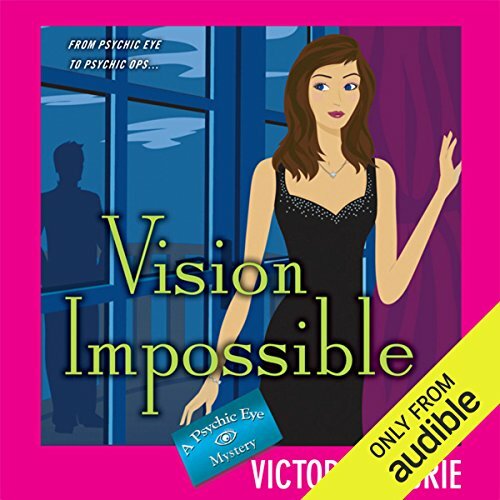 Do you think Vision Impossible needs a follow-up book? Why or why not? Only if it is shorter and better written.